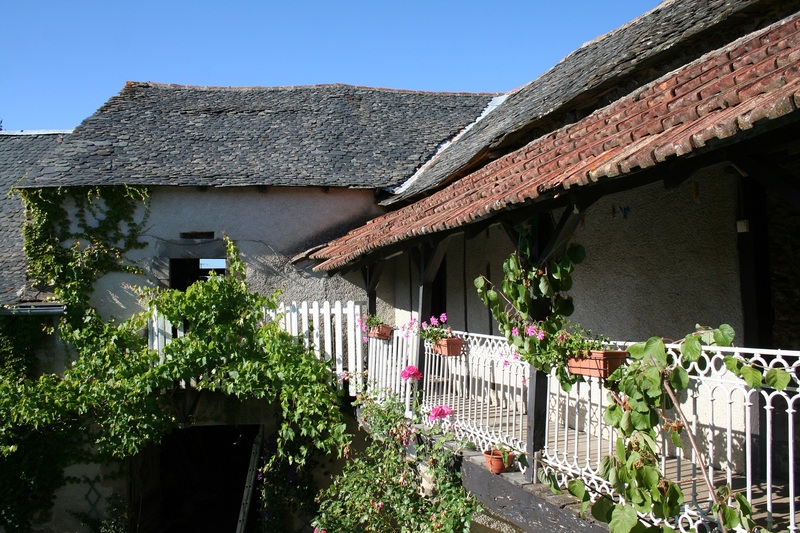 You are guaranteed a peaceful and genuinely rustic stay at Os Figueiros in one of the most picturesque parts of France. Our rooms are furnished in a country-style with wooden floors, antique furniture, cosy beds and full bookshelves. Step out of your room on to the rose and vine-strewn balcony and look out over our ancient courtyard where you can feast on local and homegrown produce around our farmhouse table, or take a picnic into the gardens. Afterwards have a swing in a hammock under the fig trees. Go on a journey back in time and discover our ancient buildings. The beautiful vaulted barn, where you are welcome to practice meditation, dance or just play. Find the Dovecote for a peep out of the window to spot someone at work in the open barn, or take a stroll out into the meadow where wild flowers grow alongside our vegetables. A walker’s paradise, you can access Le Grand Rondonee just a 15 minute walk from our door, and we are moments from forests, fields and valleys where you can roam free in nature. We are close to the river, with beautiful swimming spots and its grassy banks for cooling off (if you’re feeling daring take one of our canoes down with you.) You’ll find many attractive villages and towns nearby with traditional markets, restaurants and cafes. The nearest big town to us is Albi; a world heritage site and home to the Toulouse Lautrec museum and the ancient cathedral. We are very happy to help with planning walks, outings and where to eat out when you visit. For now here is a detailed guide to the local area. Images of the rooms and grounds are in the gallery to the right of the page. Please scroll down the page to find the different ways to come and stay here, prices and a full list of facilities and amenities. To book or if you have any questions, please get in touch! For details about getting here please see our map and travel page. Vaulted barn with performance surface suitable for dance, yoga etc.